The changes that you make to an ad campaign enter into force after sending the campaign to the Yandex.Direct server. 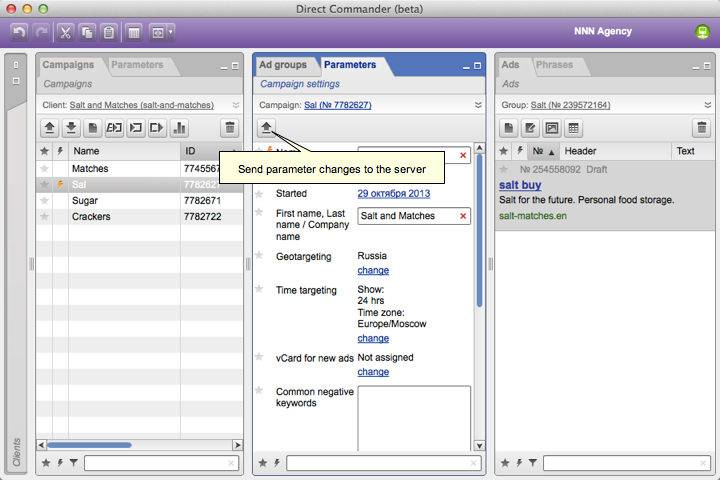 You can send either an entire ad campaign or just its parameters to the Direct server. It is not possible to send individual ad groups. Select the necessary campaign in the Campaigns tab. 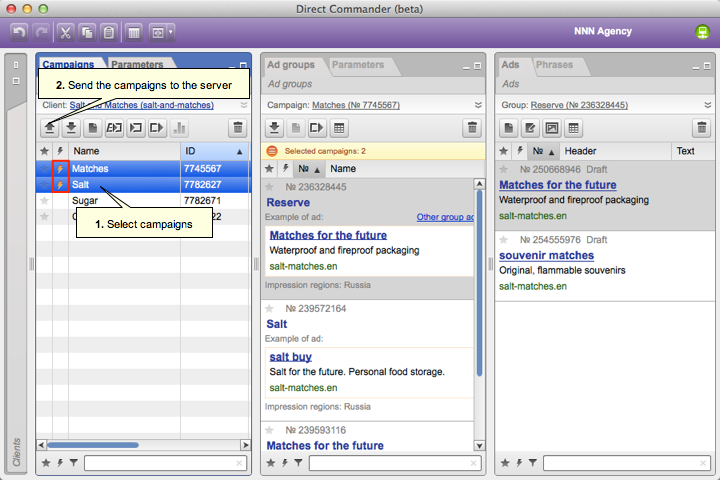 To simultaneously select several campaigns, press and hold Ctrl or Shift. Tap . 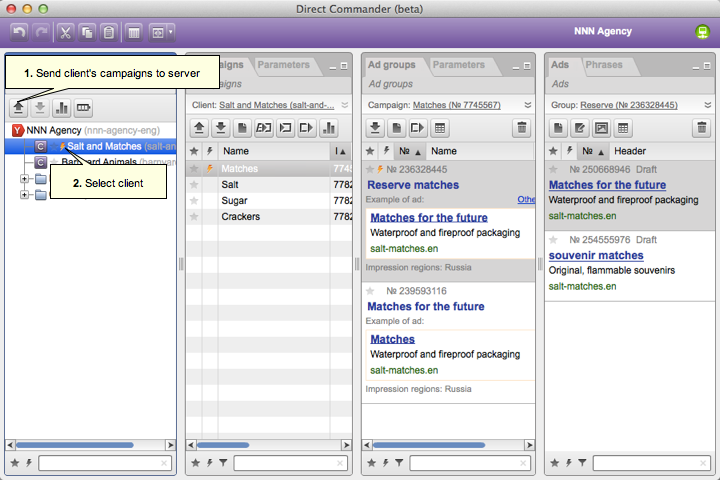 Campaigns ready to be sent to the server are marked with the icon. 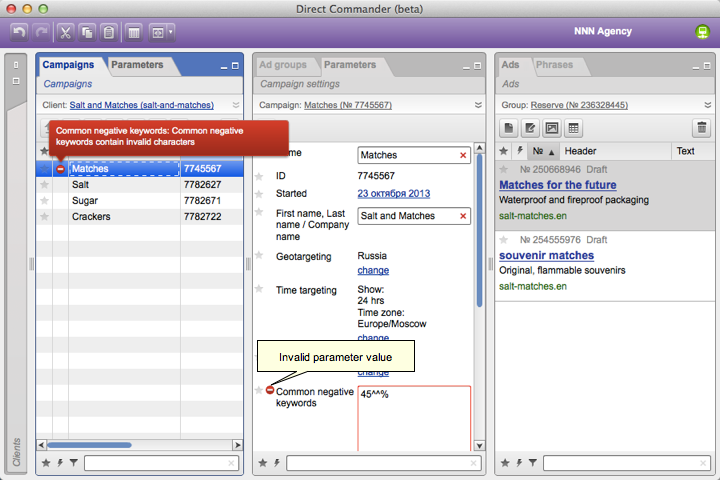 You can also send the selected campaigns' parameters in the same way. The icon means that the campaign contains errors and cannot be sent to the server. Move the mouse cursor to the icon to find out where the error is. If you are an agency representative, you can send all edited campaigns for the selected client at the same time using the button in the Clients tab. Use the button on the Phrases tab to send the bids and priorities of keywords to the server without resending the entire campaign. Clicking this button will send to the server the updated bids and priorities for all keywords available on the tab (except the new keywords which have not ever been sent to the server yet).